Let the Big "I" Professional Liability Program protect you. 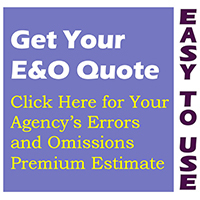 Good value, competitive premiums, and awesome service are what you can expect from IIABAZ's E&O Department. We know that price is important, but coverage is critical. Continuing Education - CIC, CISR, CRIS, E&O Loss Control, Free Member Benefit, and more. Professional education is critical to a successful and profitable career. Every year, IIABAZ offers exciting opportunities to expand your professional horizons. All designed to help you thrive in this competitive marketplace. The Big "I" community gives independent agents access to information, education, E&O coverages including agency risk management, markets, the industry's leading technical experts, advocacy (both regulatory and legislative) and more. Want to be one of the more than 300,000 insurance professionals with exclusive access? Click on JOIN above. The Independent Insurance Agents and Brokers of Arizona thanks the companies who are participating in the Partner Program as Benefactors and Supporters of the Association. Find an Agent and Get a Quote!